I finally found some time in the kitchen this weekend, when Michael and I took a much needed day off from our renovation project. Sunday was a glorious day spent sleeping in, lounging around, getting laundry done (finally), planning meals for the week, going grocery shopping and cooking. A normal day for once! It's a beautiful thing. I've been focusing on healthy meals that give me lots of energy to tackle projects like de-greasing an entire kitchen. 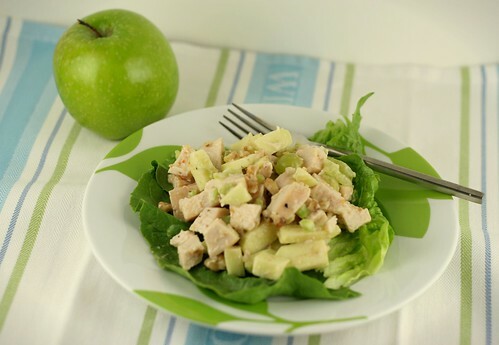 This Waldorf Chicken Salad is full of nutrients from walnuts, granny smith apples, grapes and celery. 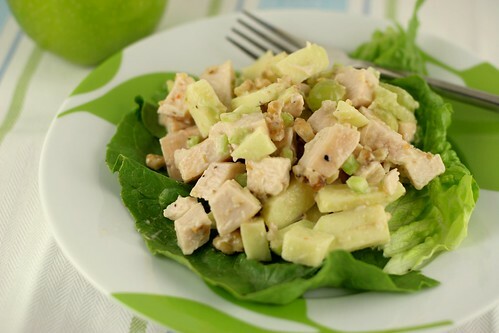 Those lovely ingredients are paired with grilled chicken and tossed in a very light mayonnaise dressing. It's the cool thing to do. 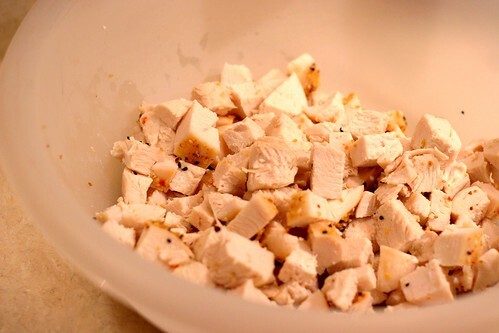 Start with cooked, cubed chicken... about 3 boneless, skinless breasts. 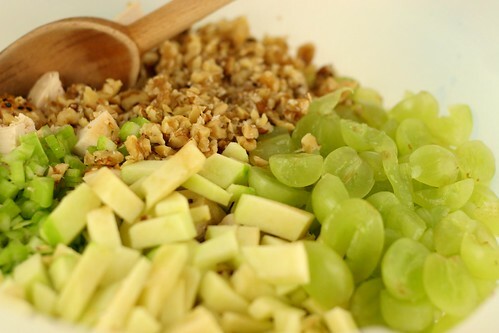 Chop up walnuts, a granny smith apple, grapes and celery. 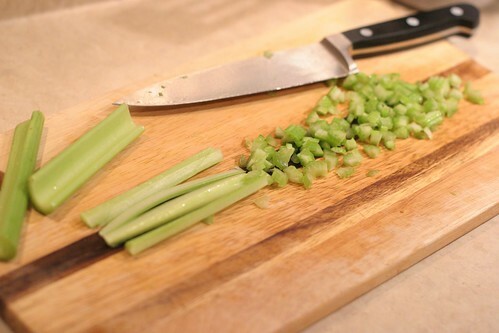 The best way I've found to finely mince celery is to first slice it length-wise into several pieces, then chop it up. Then I mixed up a light mayo/vinegar dressing and tossed the whole thing together. I'm enjoying it for lunch at work this week, over lettuce. It makes a beautiful salad. And hopefully it gives me lots of energy. We plan on painting our kitchen this week! Good-bye pink paint! 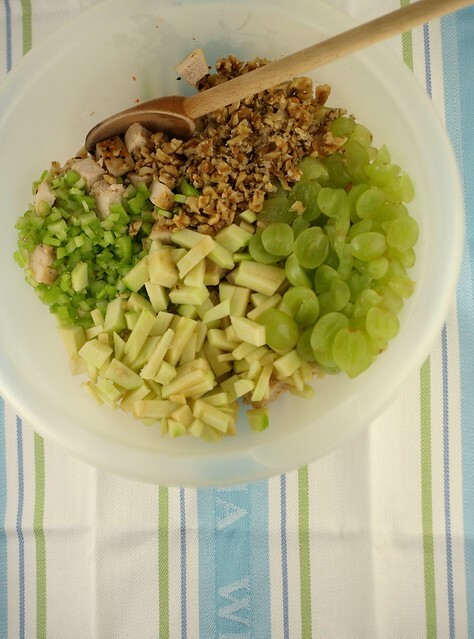 Combine chicken, celery, apple, grapes and walnuts in a large bowl. In a small bowl, whisk together mayonnaise, vinegar, sugar, salt and pepper (to taste). Pour dressing over chicken mixture and combine. It's that easy! 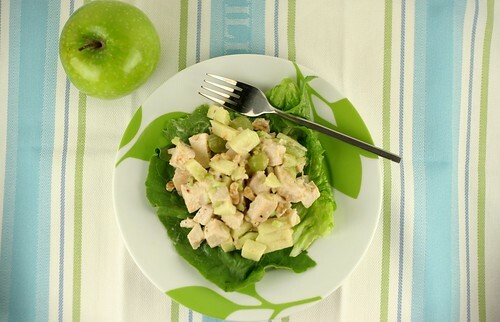 Serve chilled over lettuce. "The best way I've found to finely mince celery is to first slice it length-wise into several pieces, then chop it up." My method of preparing celery is actually very similar to this- except after those steps I toss it in the trash. I was just telling my sister-in-law about Waldorf salad because we stayed at the hotel that started it all when we were in NYC. She had never heard of it and was aghast. I told her I'd make her some, but since she's not a fan of mayo salads I'm going to have to get creative. Your version looks like the kind I would like for myself. This is definitely the kind of meal you need to fuel that crazy renovation of yours! It's jam-packed full of everything I love.